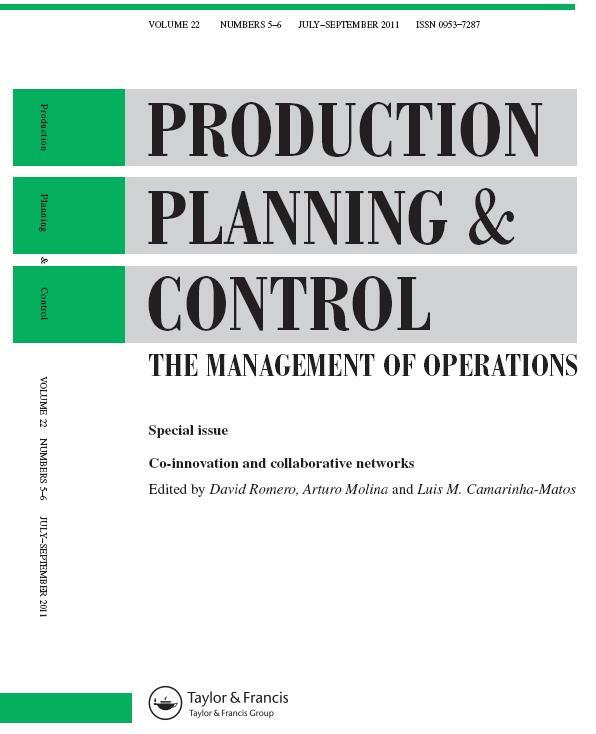 Esta Edición Especial en la revista “Production Planning & Control” presenta una excelente selección de 10 artículos que desarrollan diferentes conceptos, métodos y herramientas, así como modelos de negocio y casos de estudio, alrededor del tema de redes de innovación. Romero and Molina present an overview on network structures as a source of joint value creation and open innovation. The paper describes a literature review on value co-creation and co-innovation concepts and styles, and proposes a reference framework for creating ‘interface networks’ as enablers for linking networked organisations and customer communities to support the establishment of sustainable user-driven and collaborative innovation networks. Eschenbächer et al. present a collaborative network relationship analysis framework in their work – Improving Distributed Innovation Processes in Virtual Organisations through the Evaluation of Collaboration Intensities – as a strategic tool to study ‘collaboration intensities’ to support the management of distributed innovation processes in networked environments. The article includes a set of case studies to demonstrate the applicability of this tool in improving the distributed innovation processes that take place within virtual organisations. Ulbrich et al. present a study on ‘collaborative capability’ of teams in networked organisations focusing on the capabilities of single organisations and on their group dynamics to identify six critical success factors for successful collaboration and network management in co-innovation processes. The study was carried-out in three networked organisations. Rosas et al. undertakes the assessment of organisations’ hard and soft competencies in order to help networked organisations to find ‘competencies fitness’ to better select their network partners. The assessment tool is based on an extended competencies model that allows the construction of adjusted competencies profiles and levels to determine the competency requirements of collaboration opportunities such as co-innovation initiatives in industrial contexts. Msanjila and Afsarmanesh address the evolution of ‘trustworthiness’ as a way to raise the understanding of trust concept and its applicability to enhance and mediate collaboration among organisations. Their paper studies different trust models in organisations as well as the characterisation of the lifecycle of trust to establish fruitful collaborations, and introduces a trust management system as a tool to enhance and mediate trust evolution in collaborative innovation networks. Ollus et al. present an innovative approach for ‘collaborative project management’ focusing on the support of collaboration and communication in globally distributed projects. Their proposal includes a collaborative project management tool intended for supporting projects’ aims alignment and bridging the possible gaps that may exist within collaborative projects (e.g. co-innovation projects). Al-Ashaab et al. introduce an adapted Balanced Scorecard as a measurement tool to assess the impact of collaborative research projects under an ‘open innovation strategy’.Their contribution proposes a scorecard model to measure the outcomes of collaborative research and presents two case studies of how companies are using this tool to measure their innovation outcomes. Loss and Crave explore the concept of the ‘agile business models’ for collaborative networks and identify the levers and barriers for developing innovative business models for co-innovation networks. Berasategi et al. present an innovation framework including a reference model, a set of analysis tools and a methodology for implementing co-innovation processes within collaborative networks. The framework was developed based on the findings of an action research project carried out in real collaborative innovation networks. Budweg et al. introduce a living lab approach focused on community building and active user involvement in the process of developing and evaluating new collaboration concepts and tools in user-centric and co-innovation networks. Their paper presents a valuable framework to facilitate innovation in collaborative work environments to enhance professional communities.